Richter Trial Lawyers can guide you through the process of interpreting what a clause in a will means to ensure that you receive the gift you are entitled to. In Thorne Estate (Re), 2018 BCSC 934, two executors sought interpretation or construction of clause 3(j) of Mr. Thorne’s will. The clause provided for the deceased’s goddaughter, Ms. Zaslawska, to keep all proceeds from the sale of his residential home after certain deductions. This clause was followed by another clause that allowed her to have the right to retain title to his residential property if she took on the existing mortgage or refinanced the home. By the time of his death, Mr. Thorne had sold the residential property. Where the Deceased’s residential home was sold prior to his death, and the net proceeds of the sale of the Residence are kept separate and apart from other funds belonging to the Deceased until his death, does the gift of the Sale Proceeds of the Residence to the goddaughter fail and fall into the residue of the Deceased’s estate? The executors argued that the clause expressed the deceased’s intent; that his goddaughter was to receive the proceeds of the sale of his residence. The remaining proceeds of sale were traceable and identifiable. 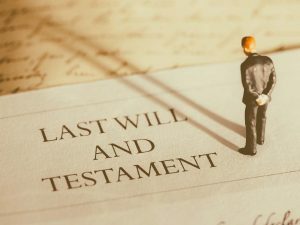 Alternatively, the executors argued that if the gift to the goddaughter was determined to be a specific gift of the proceeds of sale or retained ownership of the residence, the gift changed in form and was still part of the deceased’s property on his death. One of the beneficiaries, Mr. Gamble, objected to such a disposition of the estate. He argued that the clauses expressed the deceased’s intent that the goddaughter was to be gifted his residence. His argument was that since Mr. Thorne had sold his residence before he passed away, the specific gift to the goddaughter had adeemed or forfeited. Quite simply, she was no longer entitled to the gift and it should instead fall to the residue of the estate. Alternatively, he argued that the executors failed to keep Mr. Thorne’s residence in a traceable account and, as a result, the gift to the goddaughter had adeemed. The court determined that the deceased’s intention had been clear. The natural and ordinary meaning of the words in clause 3(j) was that the deceased intended to gift the goddaughter the sale proceeds of his residence, not the residence itself. The second paragraph of the clause just gave her an option to retain ownership of the residence under certain conditions. Further, the deceased included a gift-over provision in case the goddaughter predeceased him, which further confirmed his intention to gift her the proceeds of sale. This gift amounted to a specified amount or quantity which was to be paid out of a particular asset or account. The court also stated that what determines the outcome of the analysis is whether the converted proceeds of the intended gift can be traced and identified. Therefore, the gift of the sale proceeds to the goddaughter did not fail, and she was entitled to the remaining sale proceeds of the deceased’s estate.